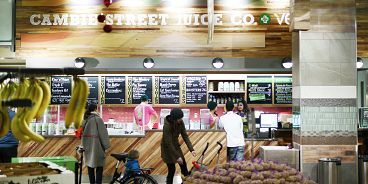 Shoppers at Whole Foods Market’s Cambie store location can now get a first look and taste of Cambie Street Juice Co., a new specialty juice and smoothie bar. Whole Foods Market is proudly launching the juice bar in partnership with Vancouver-based Vega, the leader in clean, plant-based nutrition. Customers can also purchase wheatgrass and wellness shots, as well as choose from a variety of boosts to add to their smoothies.